The protection of your privacy throughout the course of processing personal data is an important concern to us. We only process the personal data of our users if this is necessary to provide a functional website as well as for our content and services. The processing of the personal data of our users takes place regularly only after the consent of the user. An exception applies in those cases where prior consent cannot be obtained due to practical reasons, and the processing of the data is permitted by legal regulations, or when processing is necessary for the purposes of the legitimate interests pursued by the controller or by a third party according to Article 6 (1) (a) of GDPR or other valid reasons set forth in Article 6. The use of our website is generally possible without collecting personal data. In the event of collection of personal data (for example, name, address or e-mail addresses) on our sites, this is always done, as far as is possible, on a voluntary basis. This data will not be passed on to third parties without your express permission. The personal data of the person in question will be deleted or blocked as soon as the purpose of processing and the legal ground ceases to apply. Furthermore, the data may be stored if this has been provided for by the European or national legislator in EU regulations, laws or other provisions to which the Personal Data Controller is subject. The data will also be blocked or deleted if a storage period prescribed by the aforementioned standards expires, unless there is a need for further storage of the data for the conclusion or fulfillment of a contract. The data will be deleted as soon as it is no longer necessary for attaining the purpose for which it was collected, and where there is no other legal ground for the processing. In case of collection of data for the provision of a website, this means the end of the respective session. The collection of data for the provision of the website and the storage of data in log files is necessary for the website’s operation. Consequently, there is no possibility of objection on the part of the user. The user data collected in this way is pseudo anonymized by technical precautions. Therefore, it is no longer possible to assign the data to the accessing user. The data is not stored together with other personal data of users. Analysis cookies are used to improve the quality of our website and its content. Through analysis cookies, we learn how the website is used and, therefore, we are able to continually optimize our delivery of information. The data will be deleted as soon as it is no longer necessary for attaining the purpose for which it was collected, and where there is no other legal ground for the processing. The user's e-mail address will, therefore, be stored for as long as the subscription to the newsletter is active. The subscription to the newsletter can be cancelled by the user concerned at any time. For this purpose, there is a respective link (‘unsubscribe’) in every newsletter. The subscription to the newsletter can be cancelled by the user concerned at any time. For this purpose, please send us an e-mail to v.gоlovaschuk@vents.kiev.ua. The data will be deleted as soon as it is no longer necessary for attaining the purpose for which it was collected, and where there is no other legal ground for the processing. As a user, you have the possibility to cancel your registration at any time. You can change the data stored about yourself at any time. For this purpose, write a form-free mail about this to v.gоlovaschuk@vents.kiev.ua with your details for deleting your account. The legal basis for the processing of data transmitted in the course of sending an e-mail is Art. 6 para. 1 lit. (f) of the GDPR. If the aim of the e-mail communication is the conclusion of a contract, then the additional legal basis for the processing is Art. 6 para. 1 lit. (b) of the GDPR. The data will be deleted as soon as it is no longer necessary for attaining the purpose for which it was collected, and where there is no other legal ground for the processing. For the personal data from the input form, which is part of the feedback form, and that data sent by e-mail, this moment arrives case when the respective conversation with the user is completed. The conversation is terminated once it can be seen from the circumstances that the facts in question have finally been clarified. You can change the data stored about yourself at any time. For this purpose, write a form-free mail about this to v.gоlovaschuk@vents.kiev.ua with your details for the deletion of your account. In this case all personal data stored during the establishment of a contact will be deleted, where there is no other legal ground for the processing. This website uses Google Analytics (Google Inc., 1600 Amphitheatre Parkway, Mountain View, CA 94043, USA) technology (www.google.de/analytics) to collect and store data for marketing and optimization purposes. This data can be used to create user profiles under a pseudonym. Cookies may be used for this purpose. Cookies are small text files that are stored locally in the cache of the visitor's Internet browser. Cookies enable the recognition of the Internet browser. The data collected with Google Analytics technologies will not be used to personally identify the visitor to this website and will not be combined with personal data about the bearer of the pseudonym without the explicit consent of the person in question. We would like to point out that on this website, the code <"gat._anonymizeIp();"> has been added to Google Analytics to ensure anonymous collection of IP addresses (so-called IP masking). If the anonymization is active, Google shortens IP addresses within Member States of the European Union, or in other signatory states to the Agreement on the European Economic Area, which means that no conclusions can be drawn about your identity. Only in exceptional cases will the full IP address be transmitted to a Google server in the USA and shortened there. Users can prevent the storage of cookies by setting their browser software accordingly. In addition, users can prevent the collection by Google of data generated by cookies and relating to use of online offers as well as the processing of this data by Google by downloading and installing the browser plug-in available under the following link: tools.google.com/dlpage/gaoptout. This software runs exclusively on the servers of our website. The personal data of users is only stored there. The data will not be passed on to third parties. Further information with respect to the handling of user data at Google Analytics can be found in Google's data protection statement: https://support.google.com/analytics/answer/6004245?hl=en . Our website uses the map service Google Maps from Google (Google Inc., 1600 Amphitheatre Parkway, Mountain View, CA 94043, USA) via an API. In this context, it is necessary to store your IP address. The information thus obtained is usually transferred to a Google server in the USA and stored there. We have no control over transmission of this data. Due to our justified interest in the attractive presentation of our online offers and in the ease with which the locations we have indicated on the website can be found, the choice of legal basis is consistent with Art. 6 para. 1 lit. (f) of the GDPR. Further information can be found in Google's data protection statement: https://www.google.de/intl/en/policies/privacy/. 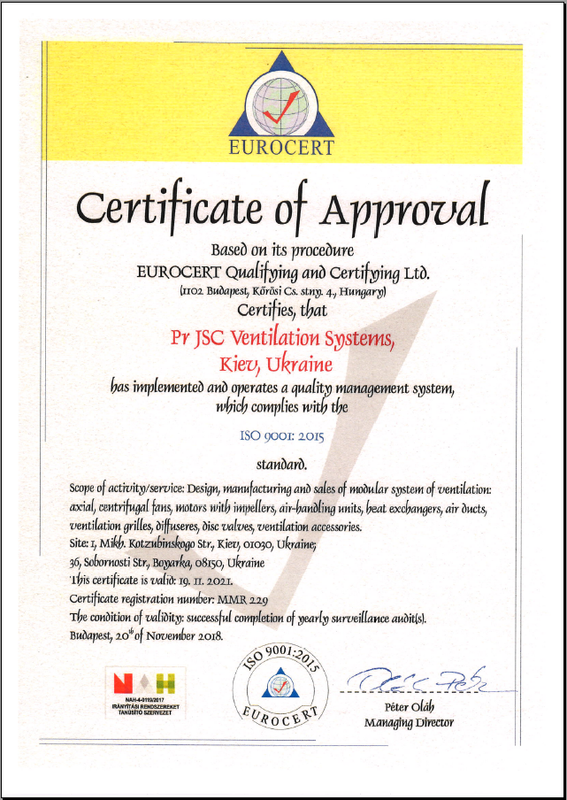 The website of PrJSC Ventilation Systems contains links to other websites. PrJSC Ventilation Systems is not responsible for the data protection policies or content of these other websites. You can require the Personal Data Controller to confirm whether your personal data are/will be processed by us, and which data are/will be processed. For this purpose, the user can send a form-free e-mail to v.gоlovaschuk@vents.kiev.ua. You have the right to request from the Personal Data Controller the making of corrections and/or additions if the personal data processed about you is incorrect or incomplete. The Personal Data Controller must make the corrections immediately. (4) if you have filed an objection to the processing pursuant to Art. 21 para. 1 of the GDPR, and it has not yet been established whether the reasonable considerations of the Personal Data Controller have priority over your considerations. If the processing of personal data regarding you has been restricted, such data may only be processed - apart from its storage - only with your consent, or for the purpose of asserting, exercising or defending rights, or protecting the rights of another individual or legal entity, or on grounds of important public interest of the European Union or any Member State. If the processing has been limited according to the above-mentioned requirements, you will be notified by the Personal Data Controller before the restriction is lifted. (5) The deletion of your personal data is necessary to fulfill a legal obligation in accordance with EU law, or the law of the Member States to which the Personal Data Controller is subject. If the Personal Data Controller has made your personal data public and is obliged to delete it pursuant to Art. 17 para. 1 of the GDPR, it shall take the appropriate measures, including technical measures, taking into account the available technology and the costs of doing so, to inform the data controllers which process personal data that you as the person in question have requested the deletion of all links to this personal data or of copies or replications of this personal data. (5) for establishing, exercising or defending legal claims. If you have exercised your right, vis-à-vis the Personal Data Controller, to have the data corrected, deleted or its processing restricted, the latter is obliged to inform all recipients to whom your personal data has been disclosed of this correction or deletion of data or restriction on processing, unless this proves impossible or involves a disproportionate sum in costs. You have the right to require the Personal Data Controller to provide you with information about such recipients. Within the framework of exercising this right, you also have the right to request that your personal data be transferred directly from one Personal Data Controller to another personal data controller, as far as this is technically feasible. The freedoms and rights of other persons must not be affected by this. The right to data portability shall not apply to the processing of personal data necessary for the performance of a task in the public interest, or in the exercise of official authority vested in the Personal Data Controller. You have the right to object at any time, for reasons arising from your particular situation, to the processing of your personal data under Article 6(1) (e) or (f) of the GDPR; this also applies to profiling based on these provisions. The Personal Data Controller halts the processing of your personal data, unless he can prove compelling and legitimate grounds for the processing, which outweigh your interests, rights and freedoms, or the processing serves to assert, exercise or defend legal claims. The legality of data processing prior to your revocation remains unchanged. In the cases referred to in (1) and (3), the Personal Data Controller shall take adequate measures to safeguard rights, freedoms and your legitimate interests, including at least the right to obtain the intervention of the Personal Data Controller, to express one’s own point of view and to challenge decisions. We have a justified interest in performing the credit assessments set forth in this section for the purpose to protect ourselves from bad debts or investments. We might commission companies performing mathematical and statistical analysis to assess the risk of payment default and deliver, within the scope of what is allowed under law, information on the probability of payment defaults. For the assessment, address data may be used, but not exclusively. In case the result of a credit assessment does not satisfy our requirements, we reserve the right to ask for an assured payment method (e.g. credit card) or to refuse to enter into a contract. Wie bequem finden Sie unsere aktualisierte Webseite?